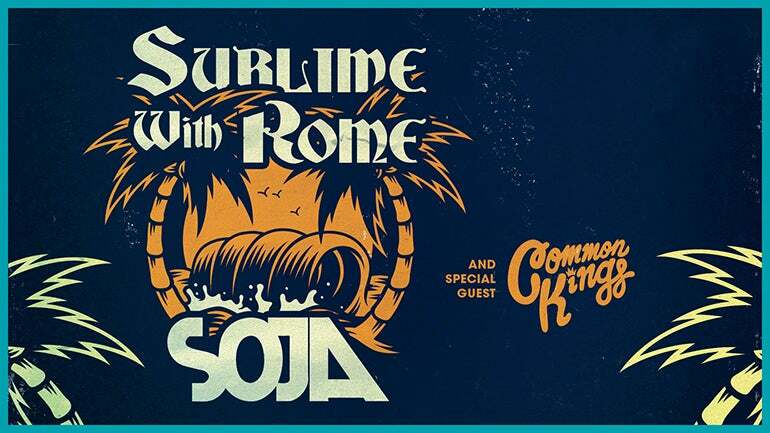 Sublime with Rome will co-headline with SOJA at the Vina Robles Amphitheatre on June 18 with special guests Common Kings. Sublime with Rome will release their first single, “Wicked Heart” in late July off their yet untitled upcoming album due out Spring 2019. This new music complements their first two album releases, Sirens; the 2015 effervescent follow up to the band's 2011 debut release Yours Truly. With Sublime bassist and co-founder, Eric Wilson anchoring the group, Sublime With Rome are armed with a new album that makes a real statement...their statement. Produced by Rob Cavallo, who has worked with Green Day, My Chemical Romance, Linkin Park and many more, the latest release is an expression of three musicians who truly get each other and who communicate seamlessly through their instruments. And while Ramirez pays the utmost respect to the original Sublime entity, since, as he admitted in the past, they were the first band that made him want to make, as opposed to just listen to, music, he knows Sublime With Rome are worthy of fan's undivided attention. "This summer, I want fans to say, 'I went to see Sublime With Rome and the new music is sick.' We can do that by continuing to make better and better records," he said. Nearly two decades ago, SOJA began as high school friends in a D.C. area basement teaching each other to be musicians and play roots reggae music. Today, the 2x GRAMMY-nominated eight-piece band, with over 7 million online followers and over 300 million Youtube views, headlines concerts all over the world for their massive dedicated fanbase. Even with their continued success, SOJA always wants to remember their time together in that basement inspired by each other’s contributions and ideas. The feeling of true magic, collaboration, and brotherhood that started it all is still evident today in their music and each night at their live concerts. For their latest studio album, Poetry In Motion (Oct 27, 2017), it was essential for SOJA to consciously go back to the beginning and recapture that same sincere, collaborative magic sparked 20 years ago.